Yes, I am that David Fant. I was a very good friend of Dave Arneson and participated in Blackmoor as well as the Napoleonic War Games that he organized. I do own two companies now. One with the link below, the other is relatively new and is in the same list brokerage business. I will try and remember the best I can, but remember all of this was 50 years ago so my memory is vague in some places. Question: How did you come to be involved with Dave Arneson and his Napoleonic Games? I had a neighborhood friend named Bill Hoyt, he was into gaming and knew Dave. One day when I was 16 he asked if I wanted to go with him and meet someone who was into tabletop gaming, I said yes. After that I would visit as often as I could and would play the Napoleonic Campaign. I was the Emperor of Austria and had some rather unorthodox methods of mounting and moving my army. I invaded Italy at one point, trapped the Roman army in a mountain pass by surrounding the north exit with artillery and infantry, and sending my calvery around the mountain to cut off retreat. Beat them that battle without firing a shot. Question: About what years if you can remember, did you play? Let’s see, I was 16, so that would be 1967 thru 1970. I entered the University of Minnesota in 1969 and got a full time summer/vacation relief job with KSTP-TV in St Paul running camera for their various programs. (I started working in television in 1967 at KTCA-TV the local PBS affiliate. I worked for them part time until I graduated High School and started at KSTP. Question: Were you a player when Blackmoor first began? Do you remember anything about the first game or two you played? One of the stories Dave Arneson liked to tell was about watching a bunch of monster movies one weekend and coming up with the idea of a game involving Blackmoor castle and dungeon. So the players came over expecting to have a Napoleonic’s game and found the model of a medieval castle sitting on the gaming table instead. Do you remember if you were at that game or anything else about it? I was at the first Blackmoor game. I arrived expecting a Napoleonic battle, and your right, there was a castle on the table, and drawings of passages. I honestly don’t recall who was there that first day, but, Dave asked if I would like to be the Baron of the Castle. I have no idea why he picked me, but that’s how I got to be Baron Fant. He explained the mission was to explore the dungeon, find treasure and kill monsters. It sounded like fun, so off we went. That was about it, rather straight forward. Question: How did you character become the Baron of Blackmoor? Flip of a coin? First to arrive for the gaming day? I have no idea, but it was fun being the Baron. Question: How did your character become sir Fang? When I graduated from high school and started working full time for KSTP I couldn’t play as often, and so instead of killing off the Baron, had him “attacked” by a vampire and turned into one. The character became Sir Fang, but I never played Blackmore as Sir Fang. I know the person who took over that role, but can’t for the life of me remember his name. Question: Did you have other characters? Not really. In fact, I know I didn’t have other characters. I was the Baron, in charge of every expedition into the dungeons and the search party. I was always the expedition leader, and the other players would follow me down into the dungeon. Question: Do you have any particular adventure memories that stand out in our mind? Sadly, I do not. I remember being in Dave’s basement, describing what we were going to do, rolling those odd sided die’s and fighting monsters. Question: I came across something I wanted to ask you about - it's from an old, second-hand source posted on the internet like 20 years ago, so probably not so reliable - Here is what it said under a heading marked "First Coot Invasion" it said "Fant & friends sneak into the Castle and open gates from inside." with the footnote that read "one of the first times … in 1970" along with a link that is long dead. I'm wondering if the incident described rings any bells at all for you? Question: In Arneson's First Fantasy Campaign booklet he writes that Baron Fant was placed in command of Blackmoor Castle after his successful operations during the first Coot invasion. Do you remember playing many medieval/miniatures battles in Blackmoor or was your character more focused on dungeon exploration or something else? 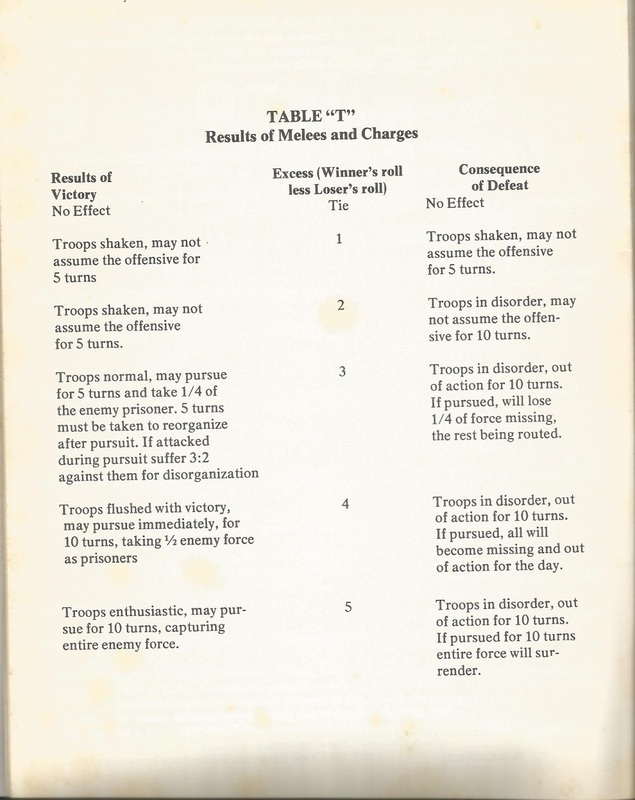 For any battles, do you remember what set of rules, if any Arneson was using? We were totally focused on Blackmoor, but we did do Napelonic campaigns some days it tended to rotate but it was mostly about Blackmoor. As for rules, at the time they were all verbal. Dave described them to us, As dungeon master if we tried something that was against the rules he would just tell us. Question: Would you say your experience in Blackmoor and your role playing the Baron was very different from your Napoleonic games or was it much the same to you? Regarding play in both Napoleonic and Blackmoor roles, for me there were similar roles. I was the Emperor of Austria, and in Blackmoor the Baron of the castle. Both senior executive roles if you will. But, in terms of play it was very different. Blackmoor you were working with others on the trip into the dungeon. You collaborated with each other, shared ideas on what to do, then fought on a one to one basis. The Napoleonic campaigns were done largely on paper, moving armies, building your army, then when a battle developed, the table top was used with miniatures. You would move your troops, give commands but it was typically me against whomever I was fighting. So it was truly a tactical one on one activity. So, in that regard the experience was very different. Question: David Megarry talked about colored markers being on the table during dungeon expeditions. I'm just trying to get a picture of how Arneson did it. Was he drawing the dungeon plan with markers on cellophane or something as you went along? And I'm assuming you would place miniatures on the table to more or less show where your characters were? As I recall, he had brown butcher block paper he would roll out on the ping pong table. For both Napoleonics and Blackmoor he would then draw the design of the terrain or dungeons. Of course that would make going from one level of the dungeon to another. Question: Did you have a chance to play in any other dungeons in the land of Blackmoor? No, only Blackmoor and under my castle. Question: Do you remember ever playing in the Great Swamp or The Temple of the Frog? Since I don’t know these names, I guess the answer is no. Question: Did you (or do you) continue to play Dungeons & Dragons or any other RPG's? Interestingly enough my wife and I both play Dungeons & Dragons online. There I am a Wizard and my wife is a fighter. Work has been so busy we haven’t had a chance to play in quite a while, but talk about needing to get back into the game and the dungeons. I don’t remember what level I am, but somewhere around a level 12 or 13. Question: Did you pay much attention to the growth of the hobby, and how did you feel about that considering your involvement in early Blackmoor? I have. I have watched the growth of the role playing games. I will admit that D&D is the only one I’ve played. And I find it exciting that I was a part of the growth of this industry. I did happen to be in St Paul the day of Dave Arneson’s viewing. An odd quirk of fate, my wife and I were driving around St Paul, I was showing her the sights, and suddenly realized I was passing the funeral home where Dave’s viewing was. I asked her if I could stop, she said of course. As I was walking in I ran into David Wesley and another gamer. We walked in, caught up on what we had been doing and I took two of the dice from the bowl to remember Dave by. Then left. I honestly don’t know why I turned down the street that the funeral home was on that day, I had never been down that street the entire time I lived in the Twin Cities. Fate? Or, the call of the Dungeon one last time. Interview with Dave Fant, Baron of Blackmoor, spring 2018. Previous version published on my Patreon Page. David Megarry's Dungeon! is fascinating on many levels. We can trace the origin of this game with an exactness that is rare in game archaeology, to an early weekend in the month of October, 1972. Dungeon!, or The Dungeons of Pasha Cada, as it was first officially named in early 1973, came about as an attempt to make a referee-less, family version of the Blackmoor game. As Dave Megarry put it, "Playing in Blackmoor is where I get my inspiration" (pers comm., Feb 2017). It is tempting to wonder then what rules and methods in Dungeon! were inspired by Blackmoor specifically, or perhaps Twin Cities play in general, including to what extent combat in Dungeon! may have been inspired by the use of Strategos, and CHAINMAIL(TM) in Blackmoor as experienced by Megarry..
As it was with Blackmoor, CHAINMAIL certainly served as a primary source for Megarry when it came to adding to his list of monsters. It is natural then to also look for CHAINMAIL influences in combat. In the 1975 printing of the Dungeon rules we are told "...the adventurer rolls two dice. If the dice roll is equal to or greater than the number listed on the Monster Card, then the monster has been defeated...: That's the same basic technique as used in the Fantasy Combat table in CM, and although rolling 2d6 verses a target number was common practice in gaming, we can say it was at least consistent with the CM method and perhaps derivitive. However, what is interesting to me, as discussed in previous posts, is the notion in Dungeon! of non-equal combat methods, like we see in D&D but not in CHAINMAIL. By that I mean, there is one table for players, and a different table for monsters. Likewise, in Dungeon!, there are two concurrent systems. The monsters simply die when you beat their "to hit" score, but something much different is done for players. "If the dice roll is less than the number shown on the Monster card, then the monster has defeated the adventurer. In such a case, the player must immediately roll 2 dice and refer to the Combat Losing Table"
That dichotomy is interesting in and of itself, but perhaps most intriguing is from where this table itself is drawn. Arneson developed the naval rules for Don't Give up the Ship(TM), to work hand in hand with Wesely's Strategos N rules as reported in COTT v3(b) #4 published in 1971 - the year before Dungeon! Below is the DGutS "Melee Results" version of table T.
If you compare table T as given in these 2 examples, to the Combat Losing Table of Dungeon!, the results show a definite bond. The table below shows this comparison directly. The first column lists the die result table in Strategos, whereas the last column shows the die results table of Dungeon, while the inner columns compare the results. *The 1971 self-published version of DGuts differs here with a loss of 4 areas and 2 morale steps. I am a great fan of the Table T concept and would have had it in mind when I did the rules. .... FYI, I was not a naval fan and hardly dealt with Dguts at all....To answer the question, I am fairly sure I had Table T in mind but don't remember using it directly when I made the combat losing table." For now, the close parallels between the DGutS table and the Combat Losing Table must remain a mystery. What all this does illustrate, yet again, is just how deeply ingrained Strategos was to Twin Cities gaming. We can't directly deduce anything from this regarding use of the Strategos in Blackmoor from these pairings. We can't work backwards and say, "Because Megarry, therefore Arneson." We do however need to acknowledge the likelihood of a strong Strategos influence in Arneson's gaming, manifesting in all sorts of ways, and we should keep the norms, mores, and formal rules of that system in mind as we sort through the historical data.